Characteristics of Effective Learning or COEL are one of the most difficult things for practitioners to remember. We know this as we often ask ours to recall them and, for the most part, they remember about half of them. In order to support their knowledge and understanding we have created a range COEL EYFS / EYFS resources. 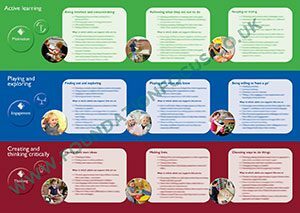 We can offer these in various formats including characteristics of effective learning keyring cards, characteristics of effective learning postcards and a characteristics of effective learning poster. Unlike other EYFS characteristics of effective learning products on the market we have added in some useful hints and tips. These help in ways in which adults can support the characteristics and what they can observe. Making them the most practical tool for each and every practitioner to have in their own tool kit. 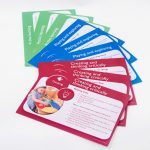 The pack consists of 9 A6 characteristics of effective learning keyring cards printed front and back. These come supplied with a detachable ring and a lanyard. 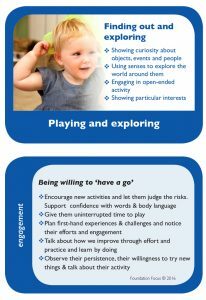 Fronts of the cards detail each characteristic and the statements from the EYFS. Reverse of the cards detail ways in which adults can provide for and support each characteristic. Anything from creating the right environment or just simply giving children time to pursue activities. The pack consists of 9 postcards printed on one side. These come as individual A6 cards so you can mount them in any space on your display boards. Alternatively they can be mounted close to various activity areas around the room – a quick and easy prompt for all practitioners. At least one for every room is a must, making it easy for parents, students and practitioners to refer to. Whichever way you choose to buy there is a COEL EYFS resource for everyone.